The national average was a bit more than 34 PAs per 100,000 population in 2013. Among States with strong physician assistant density (in darker blue), Alaska was tops with 70.3 PAs per 100,000 residents. 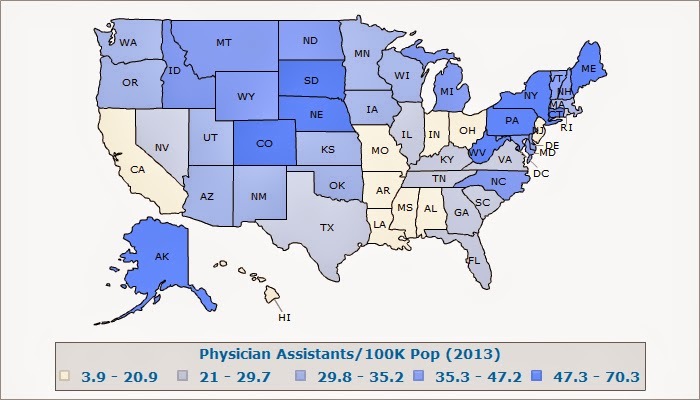 Four other States had more than 50 physician assistants per 100,000 population: New York, West Virginia, South Dakota and Maine. At the other end of the spectrum was Mississippi with just 3.9 PAs per 100,000 residents. Other States with poor PA density (in white) include Alabama, Arkansas, Indiana and Missouri, all of whom had fewer than 15 physician assistants per 100,000 population.